After finishing the last adjustments in our farmhouse, our Bed & Breakfast meets all the requirements for the 5 tulip status since March 2012. "A five tulip Bed & Breakfast belongs to the top. In the Bed & Breakfast everything is taken care of to the last detail and everything is done to give you a fantastic stay. In an accommodation of this exceptional high level nothing will be missing and the amenities, service and quality are on top level". Our Bed & Breakfast has been reviewed by a mystery guest of the Dutch Bed & Breakfast Foundation. "Our experience with B&B Hoeve Nijssen is very positive. Everything was in tip-top and very clean. The farmhouse is atmospheric and everything matches with each other. The hostess has taken care of a lot of details in the rooms, the bathrooms and also in the common areas. The reception is pleasant, the hostess pays attention to her guests and is involved with them, but she is absolutely not pushy. Breakfast is very extensive, everything is fresh, a bunch of flowers is present, etcetera. The hospitality is wonderful and is for example shown with the presence of an extensive liqueur bar which is ready to be used by guests who arrive in the evening". De Pronkkamer (The State Room) is a collaboration of more than 70 owners of small Bed and Breakfast addresses. Pronkkamers are B & B’s in authentic buildings at remarkable locations where they know the host / hostess. Guests staying in a B & B of De Pronkkamer feel special and unique. And that is precisely the added value of a Pronkkamer. Each guest is unique and has its own needs. At De Pronkkamer we put guests sincerely in the center. De Pronkkamer has quality as a top priority. Pronkkamer participants are personally visited before they can be a Pronkkamer member. Once every three years, a mystery guest visits each Pronkkamer participant in order to keep the quality high. 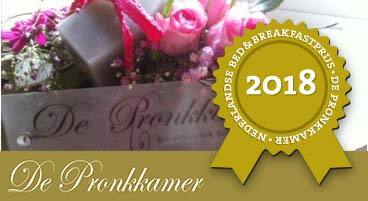 Annually the Best Bed and Breakfast of the year is elected among the Pronkkamer participants. The aim of the collaboration is to share knowledge and experience, and jointly promote these special guests stays, which the Pronkkamers are, each with their own identity.